This very long post about running my first half marathon is not for the faint of heart, so if you are one of my friends and family members who are into this one, thank you so much in advance for reading. I have so many thoughts about today—just trying to process them all, in any discursive way I can think of, ha ha! 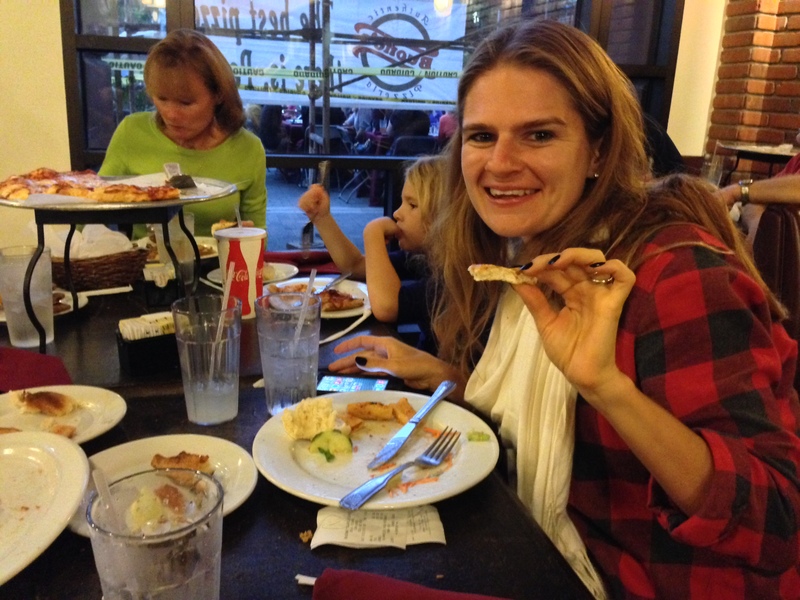 Carbo loading at Buono’s last night in Long Beach! Since children’s literature is all the rage at our house these days, on my mind as I write this journal entry is Harold and the Purple Crayon by Crockett Johnson. Harold is a young artist whose purple crayon becomes the symbol for his role as the author/creator of his life. He embarks on a journey one night—the reader assumes it is merely in Harold’s head as he draws on his paper, though there are other possibilities that are resonant of Sendak—only to find that his crayon both creates the labyrinth in which he finds himself and becomes the only tool by which he may return to his bed (or, at least, a imaginary drawing of his bed). Harold is the creator of his path. He gets lost this way and that. Sometimes he wonders where he is. Other times he is content with not having a plan and living by a stream of consciousness. He draws himself into and out of trouble. He settles down at one point for a long picnic. Mostly, he is content until that moment when he wants more than anything to get back to the place where he is himself. For awhile he cannot remember the way home, and then, suddenly he does. He remembers where his bedroom window is relative to the moon. The moon: the reflection of the sun’s fire, the symbol of what ignites to keep all of us on Earth growing and living and changing. And I grabbed my crayon, and that was running and overhauling my nutrition. And I found my moon, and that was my inner spark that I remember glowing brightly at age 17 and 18, and which I had begun to surrender until it was a dim ember. And I found my way back to myself. And I feel like the person I was when there was laughter in my eyes at everything. And I feel like that girl who had so much living left to do at 17. And I feel like the person I was when I was hungry…really hungry. Not for food, not for playing it safe, but hungry for achievement, hungry to prove my worth to myself, hungry to push myself until I could find my breaking point, hungry to know myself. To draw my own character and pathway, to write my own narrative and plot, to take ownership of flaws and all. To face fear, particularly of failure (the perfectionist’s curse), and to resolve to be stronger than that fear whatever it took. 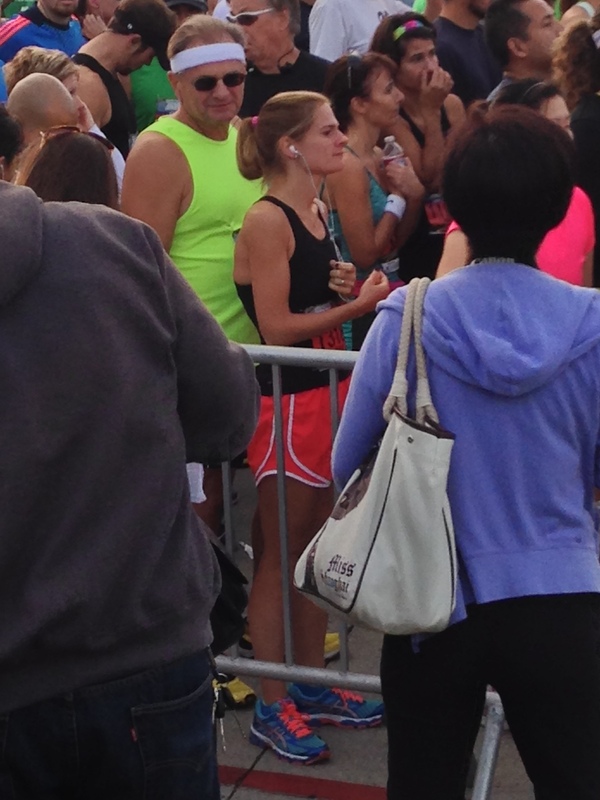 I ran my first half marathon this morning in Long Beach. 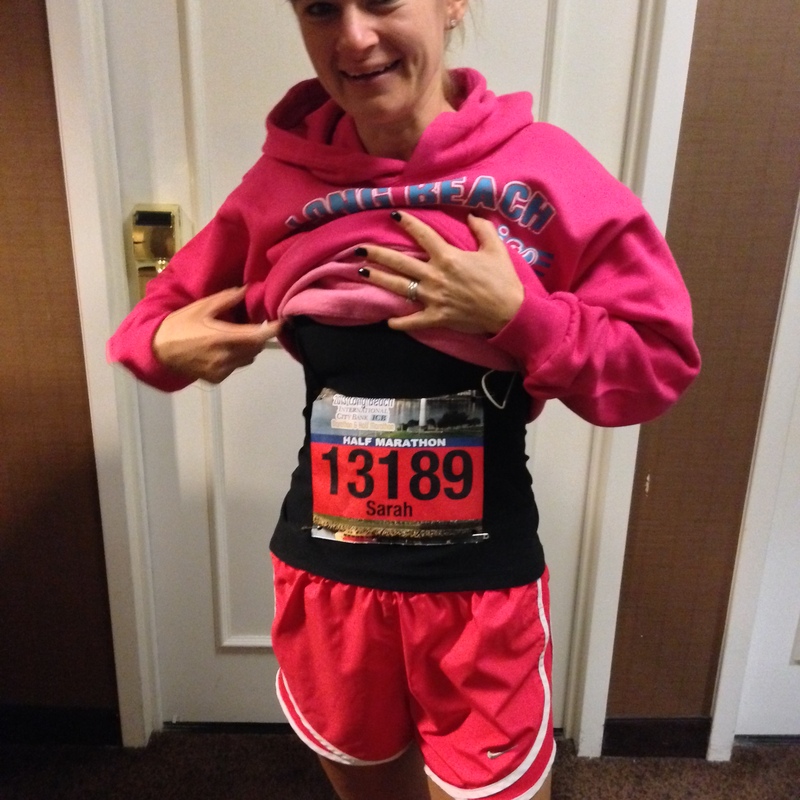 Heck, it wasn’t just my first half marathon; no, this was my first official race ever in my life. Two years ago—all of my life, in fact—I would have said I would never be the kind of person who could accomplish this. I would have laughed out loud if someone had said that one day I would be a distance runner, and not only that, but that I would love it and breathe it and want it. I have never been particularly athletic, with the exception of some rec soccer for a few years and a small period of time when I jogged and biked with my mom. I’ve never raced in a pool; I’ve never raced on a bike. In fact, I have never done anything of athletic significance. Until the past 16 months. 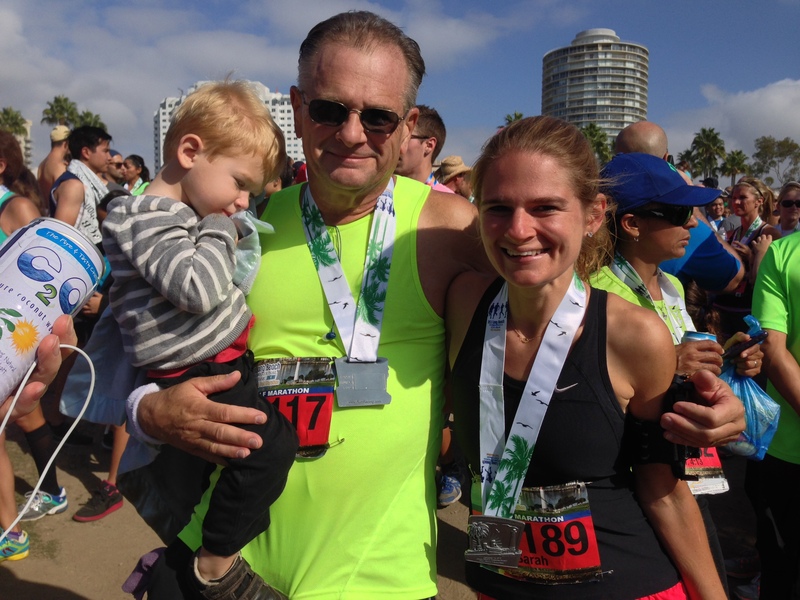 I’d already been running for about four months last October when I watched my dad race his first half marathon in Long Beach. He made me so, so proud that day. Here was a man who had completely overhauled his life, too, though that would be his story to tell. He had his crayons out and blazing for a couple of years, and I will always respect him so much for the ways that he has decided to evolve beginning in 2007. I don’t know if he was afraid when he began to seek his inner spark again, but I imagine he might have been. As I watched him race last year, it still did not occur to me that I could ever do that with him. He inspired me to keep going in my training (at that time, I was beginning to achieve 3 miles on thrice weekly runs after spending the summer struggling with 1s and 2s). He mentioned how fun it would be to run Long Beach together. Sometime in the spring of this year I hit my first 6 miles. My friend Elaine was totally inspirational, and there were others as well. One day in late spring/early summer my friend Steve mentioned that he ran an 8-er along the beach one morning. Well, of course I had to see if I could do it, too. I could…but it was slow and painful. 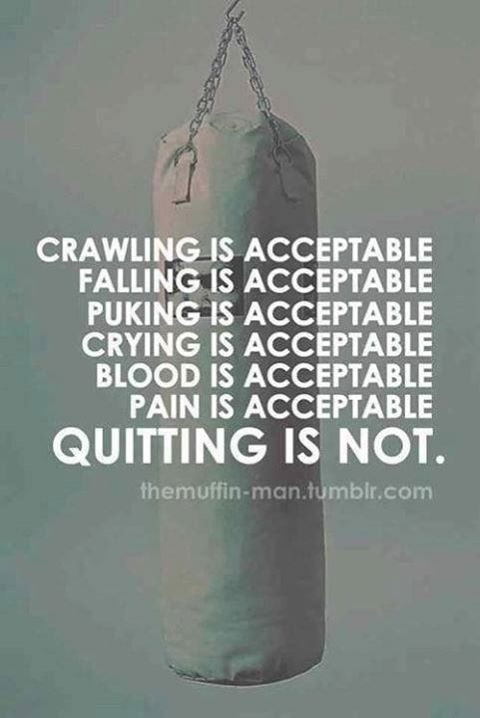 My rule for myself, though, was: when you are out for a run, you will never walk. And it had been since starting in June 2012. One crazy day I pushed myself to do 9.5. 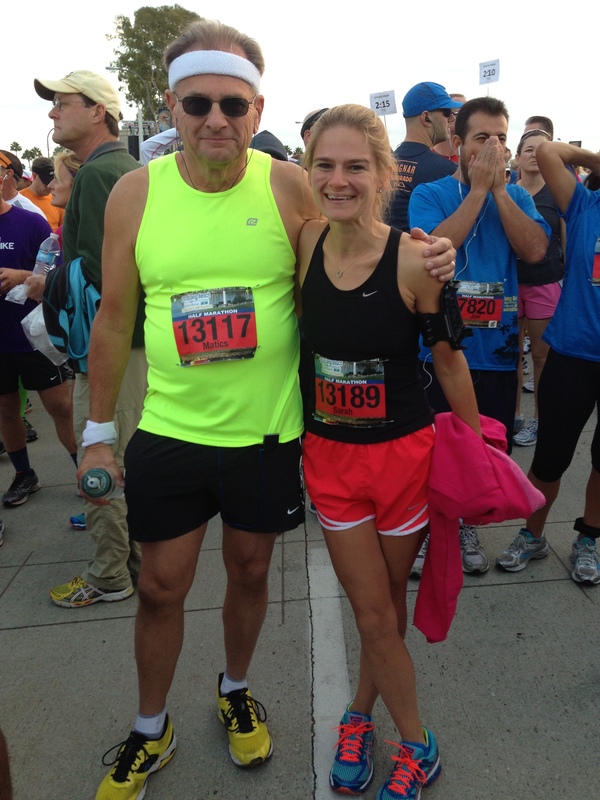 My dad intensified his call for us to do the Long Beach half together. If I committed, I was going to work at it. If I committed, I would be putting myself out there and have my times and so on looked at publicly. If I committed, it was all or nothing in the training no matter how early I had to get up or what else I had to do without (TV late at night, weekends sleeping in, coveted personal time given to this instead of to other hobbies). It would mean going out the door even if my babies were up earlier than expected and cried a bit (they did a couple times, then they adapted—good to know). It would mean, above all, becoming emotionally invested in a set of outrageous (it seemed at the time) goals and worrying about being hard on myself if I didn’t perform a certain way. Who wants to be ruled by fear, right? Plus, I wanted to experience this as a father-daughter event with my dad. It would be a memory with him. Training started. I trained at first by just varying my run lengths and listening to my body. I pushed whenever I could push. I tried to get a little faster and stronger each time. I ran at least five days a week. My initial goal was to finish the half. In mid-summer I started getting times that made me think my goal could be to finish in 2 hours. Then a couple months ago, I confided to Bill that I wanted to go sub-2 hours. 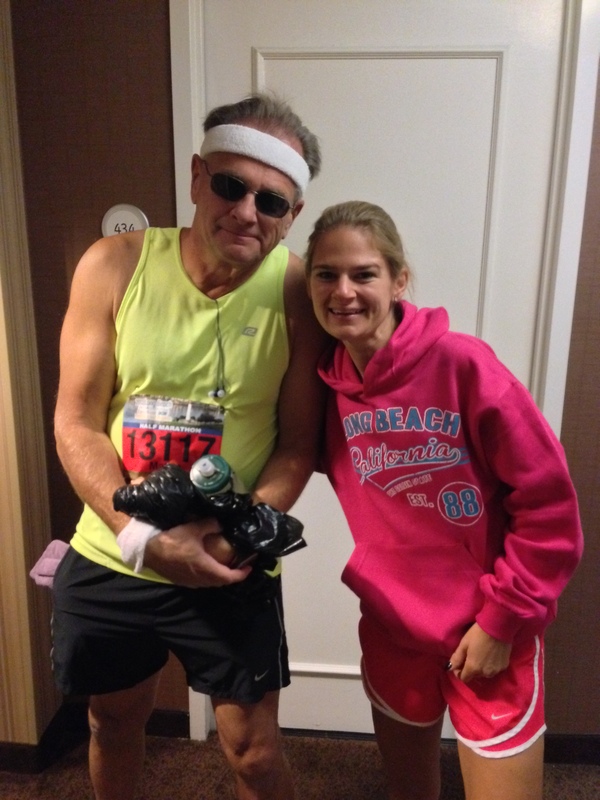 When Bill and I got married, he had no reason to believe he was marrying any kind of runner. He married me anyway, despite the fact that running had been a huge part of his life (both as a decathlete and coach) since high school. There is no one I have ever met, either, who knows more about the whole history of track and field than Bill does. He can recite stats and anecdotes about races that took place decades ago. He coached for awhile at UCR. By the time we got married, he was no longer running but it was still a HUGE passion for him that I did not share. Kind of like when I talked about Brit lit to him. I appreciated his knowledge, but we could not truly share it. We connected on so many other topics, though, that we did not need to share this. Still, I always found myself wishing I could have known him back when he ran or could access his passion with him in a more meaningful way so that I could know him as fully as possible. I trust my husband’s knowledge of running completely. I asked him to be in charge of my taper. He knows my body and had been charting my times with me. We would spend time looking at splits. I knew he would taper me perfectly. I told him that I have so much faith in him that, whatever he asked me to do for a taper, I would do without a single question. He tapered me perfectly. He spent two weeks on my taper, each day telling me what to do. He found ways to speak in a coaching language I understood describing the kinds of runs he wanted me to do and how he wanted my legs to feel when I was doing them. We are so close that sometimes it feels like our minds share thoughts. It was amazing how many times during this process, even down to the day when I whispered my new goal to him, that we were thinking the same things about the process. He asked me to do a tempo run at 5K last Saturday. I went sub-7 minutes average per mile. Many people might think that was crazy a week out, but I did it…and he was correct. I never doubted it. I knew he would get my legs to where they needed to be if I just obeyed what he asked of me. My legs felt perfect today. I could almost not believe how they felt. I could not have asked for better legs this morning. As much as I have loved my Bill, sharing this with him has only made me love him more. I don’t let many people unchecked into my “runner’s head” because it is so mental, but letting him in has made us that much closer. 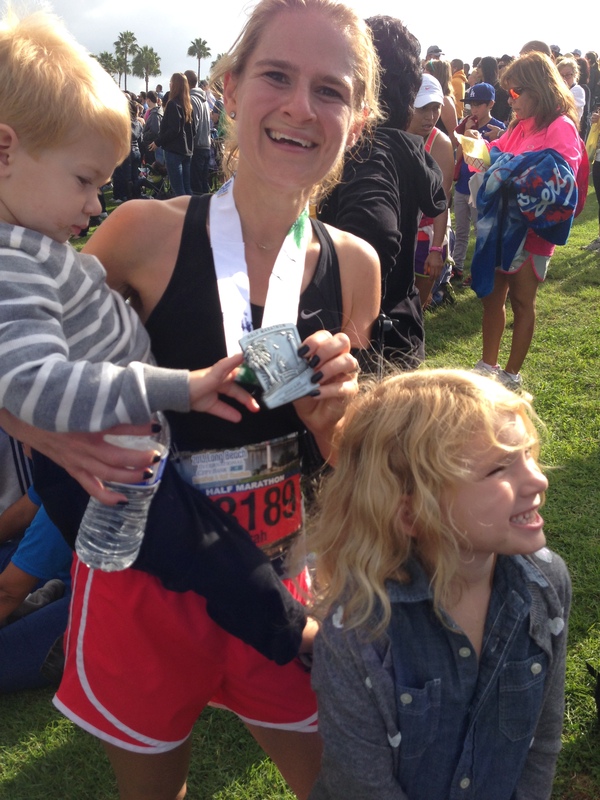 My official time for the Long Beach Half Marathon is 1:43:06. According to one result site, I was the 110th woman out of 6906. According to another, I was 107th. I was also either 19th or 20th in my age-gender grouping (Female 30-34) out of 1222. (Some of the results are still sorting out a bit). At some point, I might post the link on Facebook, but as of this writing, these are the results I have. I think if you have my bib number, you can go check, too. When I found out some of this data I was laughing, like, “WHAT?” 19th or 20th in my gender-age group? Hold on. When did I become that kind of runner? It’s almost ridiculous to think that I did that, and I will be processing that one for awhile. My splits are still coming in officially, but I have them unofficially on my GPS. Most of my miles were under 8 minutes. My average pace was 7:46. 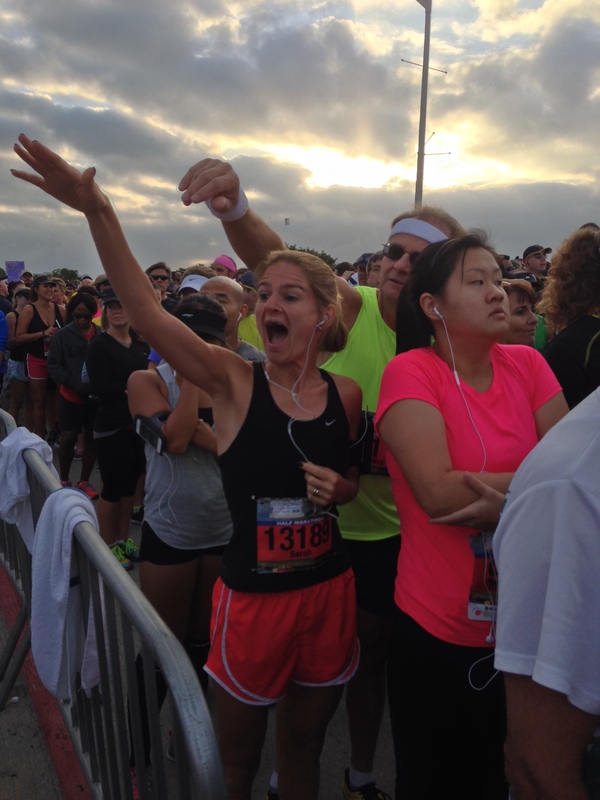 I cried a bit when I crossed the finish line, and I thought I might since I’m an ooshy-gooshy. It was the culmination of so much work, and I met my most wild goal. I felt so bowled over by how much all of that hard work paid off with that time of 1:43:06 and how this truly was one of the biggest and most important events in my life so far….right up there with marrying Bill, laboring our kiddos, getting into Stanford, and being part of the Mock Trial team that won county in 1998. This moment is part of my narrative now, and the fire within that it represents is a fundamental part of me that I will never surrender ever again. The surprising emotion occurred, though, as I was waiting in line to start with my dad. 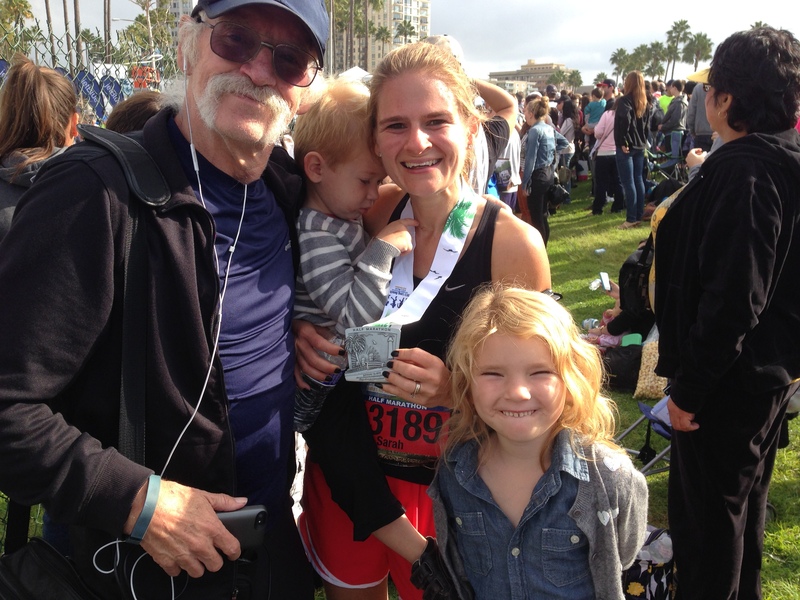 Bill, my mom, and my kiddos were over by the starting line to see us, and we were waving and blowing kisses. Suddenly I really took in the fact that my children were there…and that I so much want for them in their lives to set wild goals like this and go achieve them. I want them to feel that spark in their hearts, too. I also started thinking about how becoming a runner who is also fueling herself healthily has changed the kind of mother I am toward them (more patient, etc) and how they deserve that. Partly this whole lifestyle change started out for me, but it was also for my whole family. I want them to have me at my best—-and I am not talking about being thin. I am talking about having me at my mental best, at my most driven, at my most vibrant, my most excited and eager. And I want them to one day be as proud of me as I am of my dad. In fact, I had to look away after a point because I was starting to get weepy and I had a race to run. 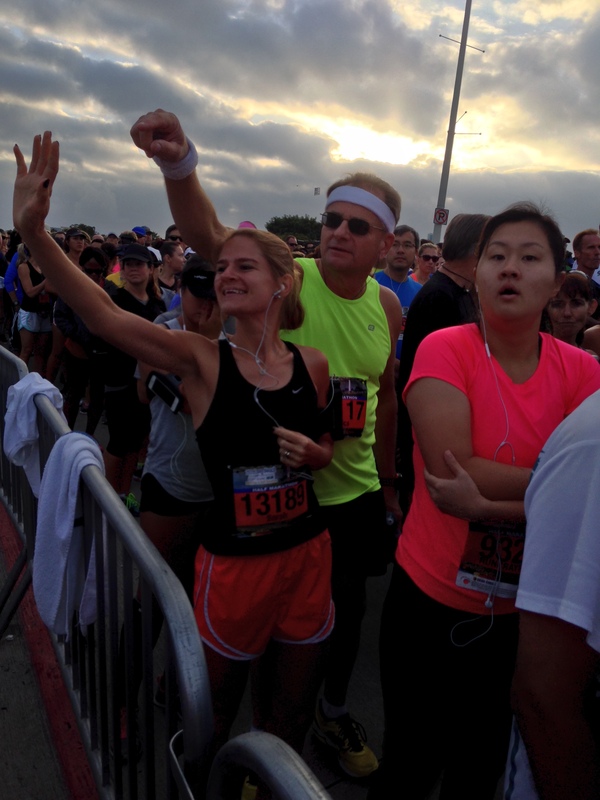 The other moment I welled up with tears was around mile two. I was crossing a bridge and looking out at the sunlight breaking through the clouds over the Queen Mary. A boat was nearby making sprays of water into designs. It was one of the most beautiful sights I ever seen, and I felt such….freedom. Like the kind of freedom where your heart soars way up into the sky and you breathe in that cleansing air and you feel so alive. 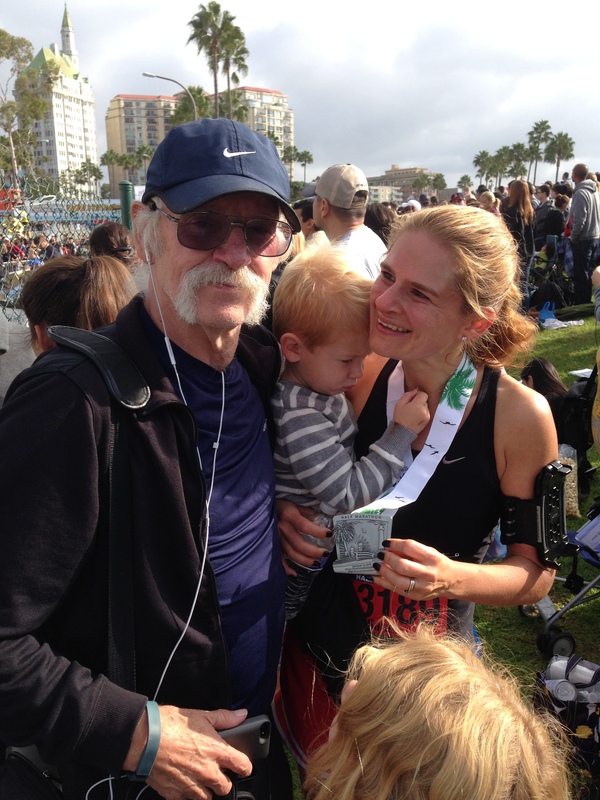 I started in the 2:10:00 wave with my dad and then decided to get quickly into my pace. I had been forewarned by many not to jump out the gate, and I took that to heart. If there was one thing I wanted to do at this race, it was to control it mentally. I did a sub-8 and wound through people. I hit my pace and then cruised. My legs felt great, thanks to Bill’s taper. The first four miles seemed to zoom by. I tried to look around and fully savor the day, and to be present. I used a playlist made up of tried and true favorites. A few days ago I tried a new playlist I had made, thinking it would be meaningful to put songs in order from childhood through present day and “run through the phases of my life” for 13.1 miles to add a layer of significance to the event. Well, I tried that out on a run and it did not work. So a couple nights ago I retooled the list to what I listen to now. Perhaps there are some phases I really don’t need to revisit, eh, even for the sake of narrative? As I headed out toward mile 6 I caught up with the pacer who was pacing for 1:50:00…and who had left a few waves before we had. I tucked in with him for awhile, then passed him. A former student of mine from 2008 lives in a house on the Belmont Shore area, and she was out cheering. That is, I knew she was, but we missed seeing each other. Still, A, I kept picturing you there and looking for you and it was extra motivating to keep doing my best. I loved everyone’s signs, and there were some really funny ones that made me laugh and smile and kept me entertained. I took water a few times but had nothing else during the race. I fueled up beforehand with a Pro Bar, which I usually eat after. I train always on no fuel, which (I happened to read a couple weeks ago in Runner’s World) apparently is a good thing to do if you want to burn carbs more efficiently on the day of a race. I didn’t know that for most of the summer, but I guess it helped. 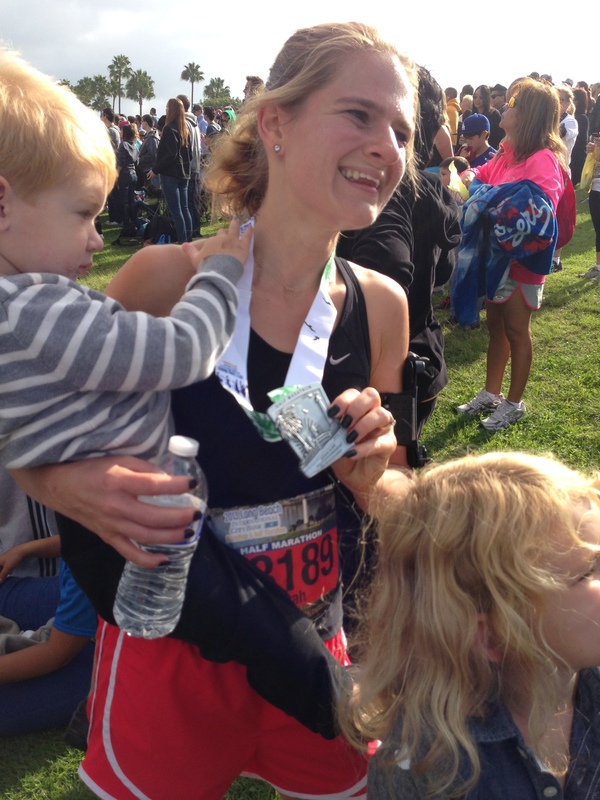 I took nutrition after the race, and the little amount I had beforehand seemed to work for me. 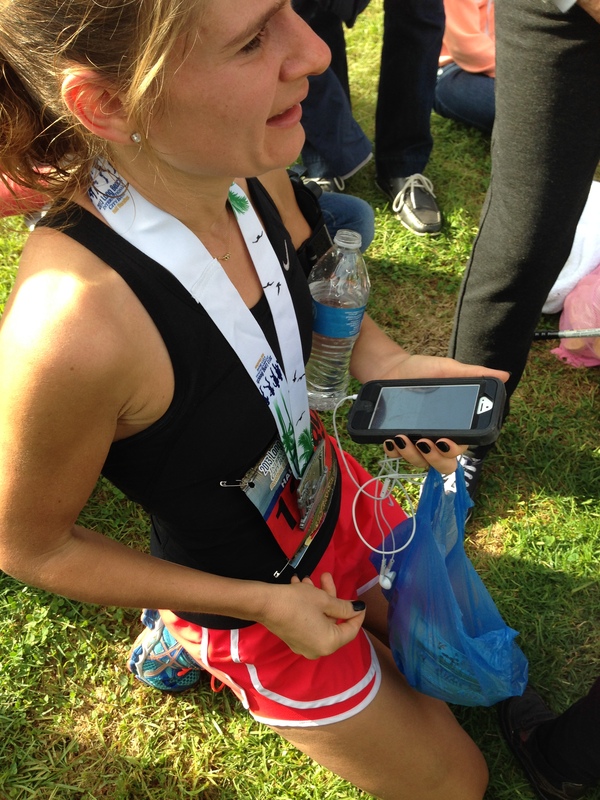 I did cramp after a bit of water around mile 9, but I ran through it. 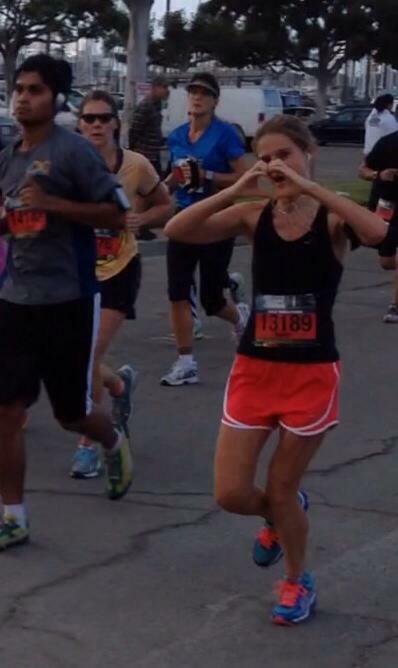 One moment I loved was Bill cheering me on around mile 6—was it? There was just this spot, and my gut knew he would be there. We hadn’t talked about it at all beforehand, not even when looking at maps. I just knew suddenly as I was approaching it that if I looked for him, I would find him there…and he was. It was this totally cool and weirdo-married-person-Oneness moment of such a bond between us that there was no doubt in my mind, and right as I came around to that straightaway, sure enough there he was just like I knew he would be. Communication on another level? It is almost like my mind’s eye saw him there before my eyes saw him there. He was tracking me in various ways (he can always see my phone’s location, for one thing), and I could tell by his face and voice that my pacing was going really well, the way he had coached me to go. It was super motivating for the next few miles. After I came in, I watched with my family for my dad to come in and then we walked back to our hotel (Hilton). We had an extended check-out time, so that gave us a bit of time to change and have a leisurely lunch. I refueled right after the race on a banana and protein bar, and then I had a yummy lunch: baba ganoush, hummus, flatbread, and then an arugula salad with red and golden beets, pecans, warm goat cheese, a bit of grilled chicken, oranges, and a pomegranate vinaigrette. All my body craved was veggies and a bit of protein. Then we came home, and it was back to our lives here. We cleaned the chicken coop, let the girls out for a run, practiced a bit of soccer for Katie, watered our mums, and generally had a quiet sort of evening. I made a super spinach and pineapple smoothie with Greek yogurt and almond butter and bee pollen to have with dinner. So yummy! Stay hungry, stay foolish, right? Thank you for sharing yourself with us. Your journey motivates me to focus more on my inner spark. This recap just makes my heart jump into my throat and long to run, run, run… This little part of me desperately wants to talk running with you in little and big details.. Mostly just pick your brain about your training and your eating and all those goods especially with my second marathon on the horizon. 🙂 Congratulations on your first race, and on your amazing pace!